However it is not easy to switch and select songs playback while sitting on MLP. Is it possible to provide a simple Android app to support remote control ? Thank you for using TuneBrowser. TuneBrowser is supporting OpenHome. So, you can use OpenHome controller like Linn Kazoo. Linn Kazoo is supporting Android. You have to enable OpenHome feature in the preference dialog box of the TuneBrowser before use. Sad, seems the LIn Kazoo doesn’t work. I have enabled open home and selected LAN interface in TuneBrowser. Launched Linn Kazoo on Android and both devices are on the same network. But Kazoo doesn’t show the TuneBrowser on the list. Is there other options for Open home controller ? I have not used TuneBrowser with OpenHome previously, so I thought I would give it a try. My computer and phone are both connected via Wi-Fi to the same router. I did NOT need to select any LAN Interface in the settings (see attached screen copy). While this may not help your problem directly, I do want to report that TB with OpenHome is working. how could you have 4.9.3? Well it was worth a try (4.9.3). You can check the LOG in TuneBrowser, it may give a clue to why you are having a problem? 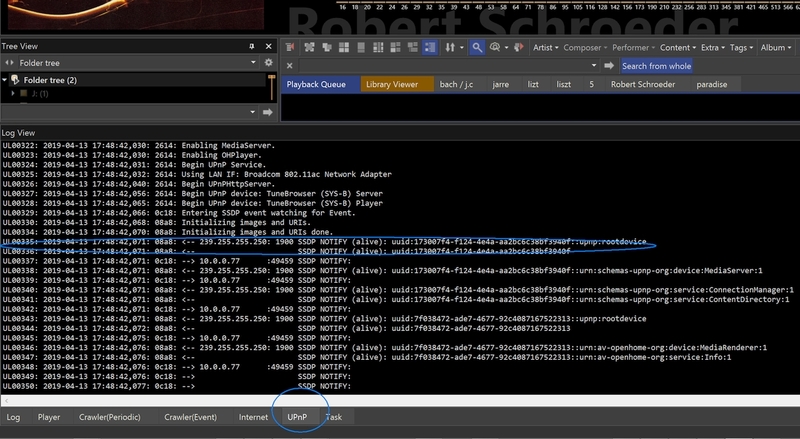 The LOG will appear at the bottom of the screen … have a look in the UPnP tab. P.S also check your PC Firewall/software setup, perhaps there is a (default) block in place? Dick1234, please check the UPnP log Andrew has suggested. If contents are difficult to understand, these log text can copy to clipboard using context (right click) menu, so please upload log text as a attachment file. thanks Andrew, it works now. thanks. I didnt change any settings afterwards, simply restart my laptop , then everything works. Great to read the ‘reboot and it works’ fixed the problem.